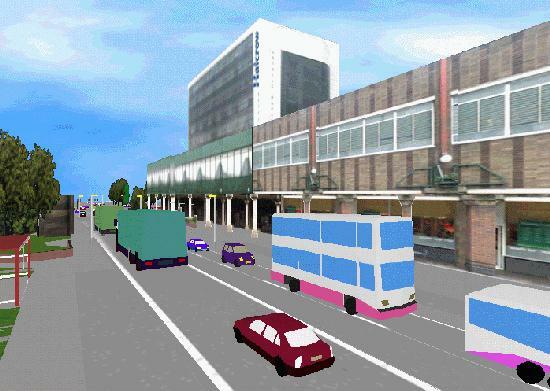 Road traffic micro-simulation models are computer models where the movements of individual vehicles travelling around road networks are determined by using simple car following, lane changing and gap acceptance rules. They are becoming increasingly popular for the evaluation and development of road traffic management and control systems. Traditional models provide an aggregated representation of traffic, typically expressed in terms of total flows per hour. In such models, all vehicles of a particular group obey the same rules of behaviour. By contrast, micro-simulation models provide a better, and 'purer', representation of actual driver behaviour and network performance. They are the only modelling tools available with the capability to examine certain complex traffic problems (e.g. intelligent transportation systems, complex junctions, shockwaves, effects of incidents). In addition, there is the appeal to users of the powerful graphics offered by most software packages that show individual vehicles traversing across networks that include a variety of road categories and junction types. This visual representation of problem and solution in a format understandable to layman and professional alike (Figure 1) can be a powerful way to gain more widespread acceptance of complex strategies. The ability to model complex highway junctions and congested networks, and at the same time provide a visual representation of the proposed effects on traffic operations, is possible with microscopic simulation. Micro-simulation can be used to develop new systems and optimise their effectiveness. They can easily estimate the impacts of a new scheme by producing outputs on a wide range of measures of effectiveness. Many of these impacts, such as the amount of pollution emissions (Figure 2), are often difficult to measure in the field. 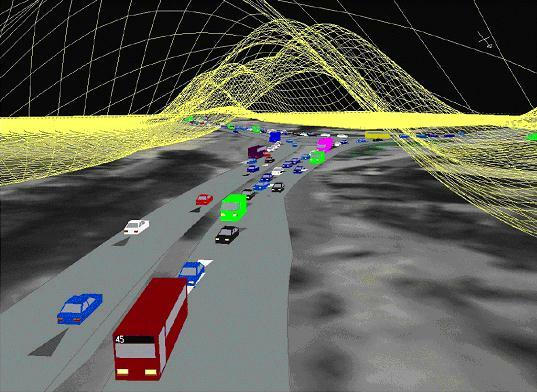 Micro-simulation is particularly suited to the development, testing and evaluation of intelligent transportation systems (ITS). Many such systems interact with individual vehicles. Responsive signal control, public transport priority and ramp metering systems react to vehicles approaching junctions. Dynamic Route Guidance systems supply specific information to individually equipped vehicles. Intelligent Cruise Control systems adjust the speeds of equipped vehicles. Therefore to assess the potential benefits of using ITS it makes sense to use an assessment tool that is capable of modelling interactions at the level of individual vehicles. Micro-simulation models, which can reproduce individual driver behaviour, should therefore be an essential part of any such assessment tool. Moreover, as individual vehicles are being modelled it is often possible to use the micro-simulator as a proxy for the real world and connect it to real systems directly. This negates the need to produce a model of the system being assessed. For example, suppose one wanted to evaluate the benefits of introducing a responsive Urban Traffic Control (UTC) system, such as SCOOT. It is possible to link up a SCOOT system to a micro-simulation package. The micro-simulator provides the SCOOT system with quarter second occupancy data as simulated vehicles pass over simulated detectors and the SCOOT system provides the micro-simulator with signal settings that it has determined will minimise costs. Micro-simulation has the potential to be used for short-term forecasting. As micro-simulation models often run much faster than real-time, they can be used to make predictions about the future state of a road network for a few hours ahead. This can be useful for applications such as incident management or setting variable speed limits. Micro-simulation tools are also capable of providing realistic training for system operators and users prior to operation in the real world. Improvements in computer performance now mean that it is possible to model peak periods on quite large road networks (hundreds of junctions and typically tens of thousands of vehicles per hour entering the network) at the micro level with a typical office PC. The pace of development of computer and telecommunications hardware shows no sign of slowing down, and the performance per unit cost of computers is ever increasing. New ITS: road side instrumentation, in-car equipment and roadside-car communications are also increasing, providing new opportunities for automatic data collection that can be used for calibration and enhancing simulation detail. However, this brings with it new problems concerning the management, calibration, interpretation and verification of the huge software systems which will need to rise to this challenge. A recent review by Williams and Tournadre (1997) on behalf of the DETR, has identified a number of possible automatic data collection opportunities, arising from the introduction of new technologies, which could benefit micro-simulation models. New traffic control and information systems are constantly being developed and deployed. These systems have to collect information about the current state of the road network. Some of this information could be used to calibrate and validate micro-simulation models. Micro-simulation models will adapt to use these new sources of data as they become increasingly available. Work is already starting as part of the Urban Traffic Management & Control (UTMC) programme on developing standard databases to store suitable data in common formats for use by transport models and information systems. As these data sets become readily available it will be possible to develop procedures which use the data to automatically build a network and calibrate and validate a micro-simulation model before it is used to develop and test schemes on a chosen test site. One of the most time consuming tasks when using a micro-simulation model is the creation of input files which describe the layout of the network to be investigated. Link lengths and widths have to be measured, the number of lanes determined, junction layouts specified, signal locations and timings entered and public transport stops and priority lanes identified. Suitable standards for digital road maps with the required level of detail for micro-simulation models are beginning to be developed for use by Geographical Information Systems (GIS) and Route Guidance Systems. As more of these systems are developed, more maps will become available and the next generation of micro-simulation models will then have them available to use directly as inputs. Once the geometry of the network has been defined, vehicles have to be added to the model. The number of vehicles is traditionally defined by specifying origin-destination (O-D) data. The collection of O-D data for input into micro-simulation models is a very time consuming and expensive task. It is usually done by placing observers on entrances and exits to the network to identify trip origins and destinations, either by number plate matching or roadside interviews. Global positioning systems (GPS) are being used in a number of transport applications to keep track of vehicle fleets. This opens up the possibility of automatically tracking equipped vehicles as they move through a network, thus determining O-D data. Systems in use include bus fleet monitoring, taxi fleet monitoring and anti-theft systems in Germany. However, trials of dynamic route guidance systems have been carried out that use GPS to determine vehicle positions. If these become more widespread then the GPS data will be able to provide O-D data for the correct traffic mix. Assignment models will also be able to be refined as routes taken through the network will also be known, so the theory can be checked against reality. The origins of microscopic traffic simulation can be traced back to the early stages of development of digital computers. 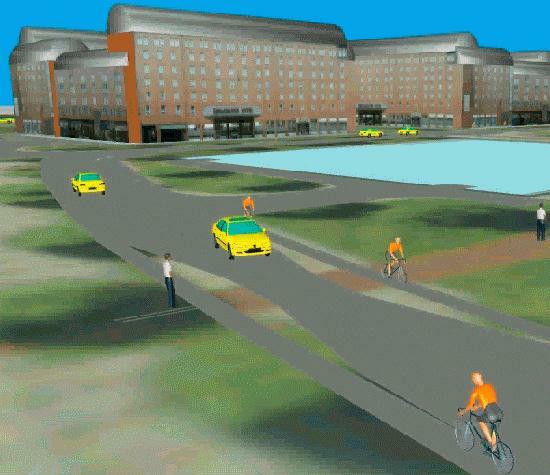 The development of car-following and lane changing rules by Gipps (1981,1986) spawned the development of many early micro-simulation models. In recent years, micro-simulation models have been increasingly used to aid studies of a wide range of transport systems (see e.g. Urban Traffic Management and Control System Development - Fox, et.al. (1995), Scemama et.al. (1996), Motorway Management System Development - Hardman (1996), Micro-simulation validation - Druitt (1998), Fox & Liu (2000), Adaptive Signal Control System Evaluation - Fox et.al. (1998), LRT Priority System Development - Fox et.al. (2000)). A review of micro-simulation models (Algers et.al., 1997) carried out as part of the European Commission funded SMARTEST project identified more than fifty road traffic micro-simulation models that had been developed around the world. Since that review was completed, more micro-simulation models have been developed. The number of possible alternatives is increasing each year. Many of the existing models however have just been developed for use on specific research tasks. The number of general purpose, commercially available micro-simulation tools that are suitable for use in the UK is much less. The main commercially available models currently suitable for modelling UK traffic networks are AIMSUN (developed by TSS, Barcelona), DRACULA (University of Leeds/ WS Atkins), HUTSIM (Helsinki University of Technology), Paramics (SIAS & Quadstone, Edinburgh), SISTM (TRL, Crowthorne) and VISSIM (PTV, Karlsruhe). Can a traditional model cope with all the issues being considered? - having assessed each of these, are there particular issues that a traditional model cannot address? Can the model cope with all the issues being considered? - having assessed each of these, are there any other particular issues that require specific model capabilities? Once you have chosen your model you then have to go through the usual traffic modelling processes of building, validating and calibrating the model and performing the model runs. Algers, S., Bernauer, E., Boero, M., Breheret, L., Di Taranto, C., Dougherty, M., Fox, K. and Gabard, J-F. (1997) "Review of Micro-simulation Models", SMARTEST Project Deliverable No. 3, European Commission DGVII, Brussels. Druitt, S. "An introduction to microsimulation", Traff. Engng Control, 39(9), September 1998. Fox, K., Montgomery, F.O. and May, A.D. (1995) "Integrated strategies for urban arterials: DRIVE II project PRIMAVERA. 1: Overview". Traff. Engng Control, 36(5), May 1995. Fox, K., Clark, S., Boddy, R., Montgomery, F.O. and Bell, M.C. (1998) "Some benefits of a SCOOT UTC System: An independent assessment by micro-simulation", Traff. Engng. Control, 39(9), 484-489. Fox, K., Hallworth, M., Collier, B. and Jones, S. (2000) "Strategic Public Transport Priority Using Selective Vehicle Detection - Does it work?" Paper presented at the European Transport Conference 2000, Homerton College Cambridge, 11-13 September 2000. PTRC. Fox, K. and Liu, R. (2000) "Do micro-simulation models give the right answers?" Paper presented at the European Transport Conference 2000, Homerton College Cambridge, 11-13 September 2000. PTRC. Gipps, P.G. (1981) "A behavioural car-following model for computer simulation" Transportation Research Board, 15-B, pp. 105-111. Gipps, P.G. (1986) "A model for the structure of lane-changing decisions" Transportation Research Board, 20-B, pp. 403-414. Hardman EJ (1996) "Motorway Speed Control Strategies Using SISTM" Proceedings of the Eighth International Conference on Road Traffic Monitoring and Control, 23-25 April 1996. Conference Publication No. 422. pp. 169-72, Institution of Electrical Engineers, Savoy Place, London, United Kingdom. Scemama, G., Fox, K., Walker, A. and Bell, M.C. (1996) "Using artificial intelligence to reduce high fuel consumption in congested cities" In the eighth international conference on road traffic monitoring and control, IEE Conference Publication 422, London, pp. 202-206. Williams B.G. and Tournadre C.V. (1997) "Existing and emerging techniques for the automatic collection of data for transport modelling", Smith System Engineering, Guildford, Surrey. Back to the Micro-simulation Page.